Have you ever heard of the Gambling Cat? Do you know where and how to spot one? Well let me tell you a little bit more about the Gambling Cat and if you're curious to find out more, please read on. Otherwise, just enjoy the picture! The Gambling Cat comes in all shapes and sizes. Some are big and fluffy, others scrawny and small. He works hard to maintain his tough guy exterior and constantly grooms himself with a grooming glove till his coat appears shiny and sleek. He means business when he plays and puts on his poker face when he finds himself playing with a new crowd. Oh yeah, the Gambling Cat also drinks a lot, but only when he loses. The Gambling Cat drowns his sorrows by drinking a special cat tonic that invigorates and keeps him on his toes; ready to pounce on his next victim at his regular poker session! But most importantly, the Gambling Cat goes to a special gambling school to obtain his Gambling PhD. He studies and reviews the best tips and strategies on all gambling related matters and gets the information he needs on the most recommended online casinos, poker rooms and casino bonus offers from over 100 trustworthy casinos online. 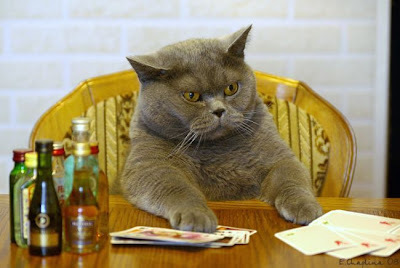 The Gambling Cat studies hard; staying up-to-date with daily gambling news and online casino news updates from the industry’s most reputable resources. And when he finally graduates with his Gambling PhD, the Gambling Cat purrs in content; eager to show off his newly acquired skills to his gambling buddies. He hopes to be the best gambler in town and goes about his merry way looking for other cats to play with! Now that you know a little bit more about the Gambling Cat, what do you think? Would you like to have him as a pet? He makes a good gambling buddy, that's for sure! hahahah.. gambling cat indeed... lol.. love the picture Mariuca! Mon still a little confused with my kids dearie hohoho! Welcome! 6 points edi, kamon catch up Mon! I’m so sleepy tonight, so lazy wanna drop 900 sigh…. U planning to drop 300 tonight Mon? heehhe.. oklah.. same same.. lol! yeah now i know hahah! meow! hohohohoho 5 meows, i lagi konpius!! LOL! hahahahaha.. cian Mon.. konpius by our kids GP!! whether it's chubbs or Benji or Phoebe. ended up i asked chubbs? Benji? wahhh yr 5 moews all same color? U don get that problem when u tweet for the draw LJ? U oso don have that prob Mon? Oh no it’s just me then huhuhuh! Tu la how cute is dat LJ? Mon confused! YAY! I got it right, Smokey black, Awan white and Aggie grey yeeehaw!!! hahahha at first i said Chubbs is white, remember? hahahahhaha!!! Minnie, NIna and Aggie are greyish brown i think..
did u log in Mariuca? ahahhahha... can you tell my cats apart Mon? Hahhahah what u mean u think LJ? Sure la u know the kaler LOL! eh but last time u said im not the only one confused mah....right?? LOL!! white and Smokey is black! too dark.. i adjusted the color and it turned out more purplish..lol! hahahaha.. coz sometimes they are more grey than brown...lol! yeah coz a bit hungry edi! oh maybe u go sleep first then wake up and drop? I’ve been getting dis problem u know and then dat day they sent me email…what does it mean eh??? We just realized that on the main page of TweetLarge.com we had left the contact email unchanged after closing the gmail account. Truly very sorry about that. If you have tried to reach us and we didn't respond, it is likely because you used the email address associated with our "Contact"
So, just letting you know that we corrected that so that it now reflects the proper contact email. yalor what u mean u think LJ? LOL!!! Yeah, LR a little confused and Jackie oso! Meow! ;) But GG not confused haha! Wah LJ so fast at awesome!!!! Yeah la!!!!! Chubbs is black it seems hahahhahahah! Poor Chubbs sad u said he’s black hahah! huh? must press claim ah??? I tot for real u got purple cat hohohoho! no wonder i cannot win lah i didnt press claim! LOL!!! I wan a white cat with blue eyes…. You all don press claim is it???? hahaahhaha.. oh that would be so unique..
Awan is white with blue eyes GP! LJ, u oso don press claim? all this while i didnt press claim Mariuca!!! i oso dunno what it means so i dont care lah LOL! I oso donno must press claim or not, just press it seems… you try doing now la, see if can press claim Mon! hahah.. yeah.. she very pretty though not as fluffy as the rest..
i got no mood to drop edi coz i didnt press claim!!! So must press claim eh? Ok ok good dat I’ve been pressing even though sometimes I get that cannot find on profile message! i press claim edi Mariuca! How is her condition LJ? Dat day kan sakit? coming to stay with us kan? Hhahahahah so cute Mon, it’s okay la, u can press claim the next round sweetie! Hugs! YAY, can lepas Mon? I will try again in ten minutes or so…since it’s every freaking hour! i think so too.. Mufasa had one blue and one yellow eyes.. lagi unique..lol! He he together-gether don understand, I feel better LOL! Oh yeah!!! I’ve seen cats with two diff kaler eyes! Yay Mufasa!!! rooms and bunk beds.. and all... yihaa! Tu la, now Awan hidup mewah gitu!! Thanks to mommy cat! Gambling cat is sooo cool! Tu la like meant to be kan? Hugsy Awan! الآن مع شركة سوقني سوف تحصل معنا علي أفضل تصميم موقع الكتروني متميز و علي أعلي مستوي حيث تضم الشركة فريق مختص بمجال التصميم و التسويق. الان من خلا اكبر شركات صيانة الاجهزة الكهربائية علي اعلي مستوي من خلال افضل شركة صيانة الاجهزة الكهربائية علي اعلي مستوي من خلالنا في صيانة يونيفرسال والتي تقوم بصيانة الاجهزة الكهربائية علي اعلي مستوي من خللانا فقط.